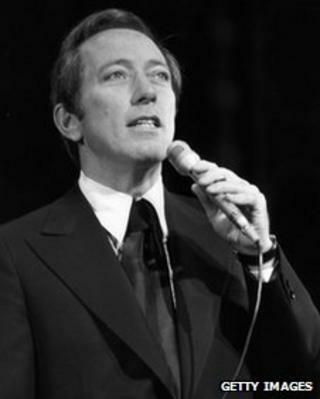 Singer Andy Williams, 84, has died at his home in Branson, Missouri, a year after being diagnosed with bladder cancer. He was best known for his version of the song Moon River, originally written for the film Breakfast at Tiffany's. Since the 1990s, he had run the Andy Williams Moon River Theater in his home town. The singer was one of the most enduring stars of the 1960s and '70s, whose easy style and mellow voice led President Ronald Reagan to call him "a national treasure". A new generation discovered Williams' music when Music to Watch Girls Go By made the Top 10 in 1999 after being used in an advert. He described Moon River as his "signature song" which had a "wonderful" melody and "timeless" lyrics. "I never tried to sing like anybody else, fortunately I didn't sound like anybody else. It just happened," said Williams. "I was very lucky that I had a voice that sounded different to almost anybody else's and it's recognisable." Fellow crooner Tony Christie, who achieved chart success with Is This The Way To Amarillo, described Williams as "a very charming man" who had "perfect pitch". The singer was "one of the old school," he added, "and there aren't many left". Williams died on Tuesday night and is survived by his wife, Debbie, and his three children, Robert, Noelle and Christian. Howard Andrew Williams was born in Iowa and started singing professionally with his three brothers as the Williams Brothers Quartet. They worked in night clubs and on radio and backed Bing Crosby on his number one record Swinging on a Star in 1944. Media captionJimmy Osmond said that without Williams the Osmonds "probably wouldn't have been around"
Williams' TV show made him an international star and launched a recording career that spawned such hits as Butterfly, Love Story, Can't Get Used to Losing You and Almost There. The weekly show lasted nine years and will be remembered by many for introducing the Osmond family to the world. In a statement, Donny Osmond described Williams as inspiring in music and in life, and said the "warmth and grace of his singing" had shaped his own love of music. Donny later joined his brothers to tour with Williams as his opening act and as back-up singers. "He truly was a great singer and I will ever be indebted to Andy for giving me the opportunity to fulfil my dreams and the opportunity to be personally inspired by such a generous talent," he said. Williams became a major star in 1956, the same year that Elvis Presley shot to fame, and was well loved in the 1960s. "The old cliche says that if you can remember the 1960s, you weren't there," said the singer. "Well, I was there all right, but my memory of them is blurred - not by any drugs I took but by the relentless pace of the schedule I set myself." In 1962 he married Claudine Longet, a French actress and singer, with whom he had three children before their divorce in 1975. Williams continued to play live into his 80s. During a 2007 tour of the UK, he said that performing kept him vital. "Perhaps that two hours out onstage is the medicine that everybody should have," he told a reporter. In November 2011, he revealed he had been diagnosed with bladder cancer but said he planned to continue performing at his own theatre. He said at the time that bladder cancer was "no longer a death sentence" and that "people with cancer are getting through this thing". "They're kicking it, and they're winning more and more every year. And I'm going to be one of them," he went on. Williams left hospital in July to spend his final days at home with his family. In lieu of flowers, his family has asked that donations be made to the Bladder Cancer Advocacy Network.